Hello readers. You are clicking on this page because you want some more information on the guy who is reblogging a life experience that happened 10 years ago (possibly more depending on when you are reading this). My name is Andrew and I was born in Comox, Canada in July 1978. I grew up in a small town outside of Winnipeg. In high school I was the kid who didn’t play sports and listened to “weird” music. In University I spent two years working on a computer science degree before realizing that I didn’t really like computer science. After a two year hiatus filled with part time classes and work I returned to University to get a business degree with a major in accounting. The goal was to graduate, get an accounting designation, and then get a job and work for the rest of my life. Along the way I took into to Japanese as an elective course. I loved the course so much that I followed up with Intermediate Japanese and then decided to spend a year teaching English in Japan. 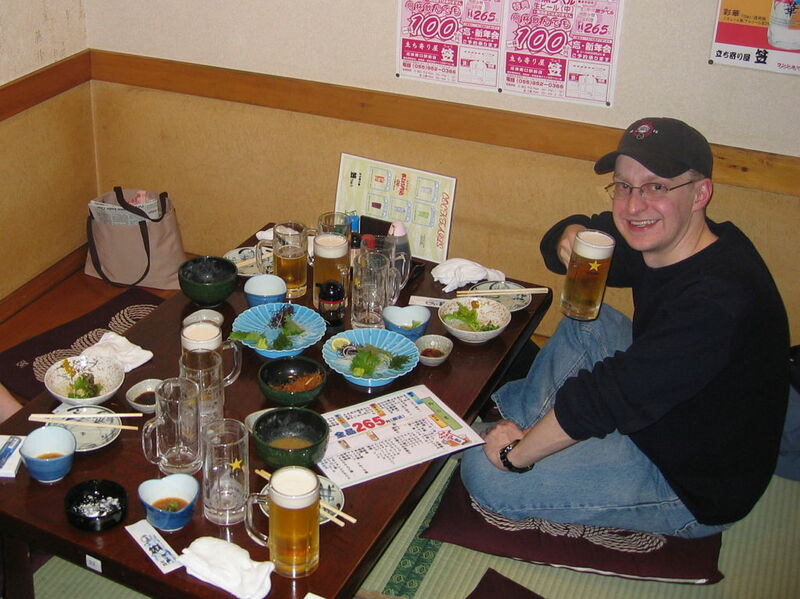 As you will learn my reading the blog, one year in Japan ended up turning into three. I returned to Canada in late 2006, got my professional accounting designation, and now work a manager for a large Canadian corporation. I am happily married to a wonderful woman, and we just welcomed our first child in February 2014. Read about the story of our son’s birth here. When I am not crunching numbers and taking care of the baby, I spend my time playing video games, watching movies, learning how to play the bass guitar, listening to music, blogging music videos on Tumblr, watching UFC, and of course, drinking beer. I am also a big fan of the Winnipeg Jets (GO JETS GO!). My goal in life is to retire at a sensible age and spend summers in Canada and winters in Japan. Thanks for the nomination!! I will be working on my facts and answers ASAP! Do you live in Canada or Japan now? Was your baby born last month? Boy or girl? I lived in Japan from September 2003 to November 2006, and have been living in Winnipeg, Canada ever since then. I do return to Japan every 2 years to visit my in-laws. Our baby boy was born in February – I need to update my “about me” page! Oh, three years. What part of Japan? >I do return to Japan every 2 years to visit my in-laws. So often? For how long? When was the most recent visit? When will be the next? I’d like to visit America that often but it’s too expensive! I haven’t been back there in ten years! America has become a foreign country to me! (Spoiler alert) – I spent one year in Kawasaki and the moved to Numazu in Shizuoka prefecture for two years. When we return to Japan, we usually stay in Numazu, but I often spend some time in Tokyo and Yokohama. Typically we visit for 2-3 weeks. My last visit was in summer 2013 which also included a trip to Koriyama. You can read about it in my “return to Japan” section here. We are considering going to Japan for New Years, depending on how comfortable we feel travelling with the baby. If you have any tips for long flights with a baby I would be happy to hear them. We try to get back often because my wife is an only child, so it’s tough to be away from her parents. Also, I love going to Japan! The travel can get expensive with two adults. I don’t even want to think what it would cost for a family of five!! >If you have any tips for long flights with a baby I would be happy to hear them. Well, I’ve only done that flight once (round trip) when my kids were small. By New Years, your kid will be about eight months old. In a carry-on, pack small snacks and toys that he likes. With those and a nap on the plane, he should be OK.
>I don’t even want to think what it would cost for a family of five!! A lot! Especially since, airlines raise prices when kids are on holiday from school!